Party: Glenn Clark, Jake Tamepo, Virginia Young, Rob Langford, Charlie& Joy Browne, and John Ridgway. Left Glenn’s at 6.45 A.M. and travelled to Wellington via S.H. 1, stopping at Taupo Visitor’s Centre to purchase Annual Hut Passes for some of us, and Turangi and Bulls for fuel. Our 2.30 P.M. sailing on the Lynx left on time, and we arrived in Picton at 5.45 P.M. Off to Blenheim for some tea at Mandy’s Carvery, which was very nice. Arrived at St. Arnaud and our accommodation at the Yellow House at around 8.30 P.M.
Up at 7.00 A.M. Had breakfast and sorted gear. Glenn had booked a shuttle bus to pick us up at 8.30 A.M. our vehicles staying at the Yellow House. Peter Kemp from St. Arnaud Shuttles arrived on time and he transported us through the Wairau Valley and Rainbow Station, a journey of approx. 20 ks to the start of the track up the Rainbow Valley. Had to pay $20.00 to the farm manager at a locked gate. This road services the Rainbow Ski Field and goes through to Hanmer Springs. We set off at 10.00 A.M. on a hot summer’s day, up the valley. For a good part of the way the track follows a 4x4 track up the Rainbow River, criss crossing it several times. Had morning tea after about an hours walking up the valley near Rainbow Hut, a 4 bunk hut on D.O.C.’s doomed list due to lack of use. For the next 30 mins. or so, the track climbs, bypassing a gorge below. Over the top is a gate, and spread out in front of us, the Begley River flowing in from a valley on the right, the Paske River flowing in from the left to join the Rainbow River. Set amongst the golden hues of wide tussock plains made for a great view. We had lunch in the shade in the valley. After lunch we followed the Paske River, and walking up this valley it was a mixture of terraces, tussock, and generally finding our own way. About half an hour or so from the hut we went through some beech forest, coming out on a scree bed to see the hut situated in the distance amongst the tussock, with the river below. A very much welcome sight after walking in the hot sun for a good part of the day. We arrived at Paske Hut at approx. 4.00 P.M. This hut is an original Forest Service Hut, 6 bunk, with a huge wide fireplace. 6 hour day. Monday 21st February - 6.5 Kms (1200m start of day – 1700m end of day). Left Paske Hut 8.15 A.M. in misty fog, heading for Paske Saddle, following left branch of the river up, but ended up in the gorge with an ice shelf we had to get up on and across, this ice shelf ended in a rocky gorge complete with a lovely waterfall. No way we could get up and around this, so either back down or scramble straight up to the left over rocks, scree, snowgrass and tussock for about 100 metres to get back onto the tops, where we should be. Up we went! Once we were up, the fog was still all around, so it was GPS and map and compass to set the course for the saddle. Another climb up and over scree and alpine herbfields, saw us at the top of Paske Saddle (1800m) A cold wind was blowing up from the other side, so our morning tea was in the shelter of some rocks. A rather steep descent of 550m took us down to the Clarence River, upstream of Lake Tennyson. The sun was trying hard to break through. It was decided to have lunch and a lie in the sun by the river. Further down the valley, Hereford cattle were grazing. Continued on our way at 1.15 P.M. and river bashed our way up river, through scrub and over boulders until we came to another ice shelf. Rob bashed the river a little too hard….cutting his leg as he slipped on rocks. We eagerly anticipated our chopper rescue, however, the bleeding stopped and we had to continue walking. To our right was the direction of travel – another stiff climb! Straight up over alpine herb fields, and rocks to get up 500m to an un-named pass that we have to go over. Arrived on a rocky flat section at about 3.00 P.M. It was a unanimous decision to set up camp on the herbfields below us, as A) the weather was perfect for fly camping and B) we were all getting tired, as we had done a fair bit of climbing already and the prospect of another hour or so of climbing to go over the pass was not exactly exciting! 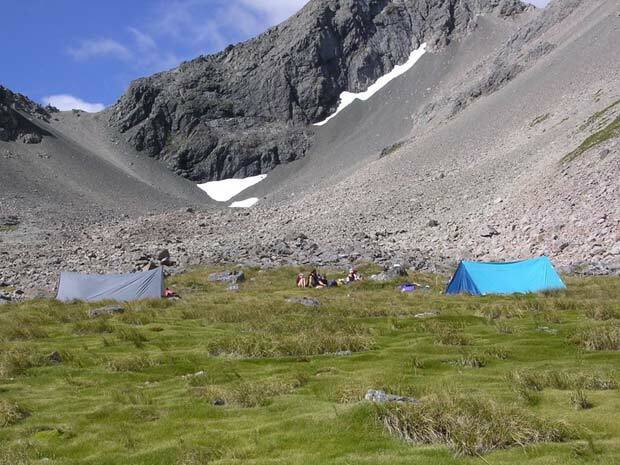 This camp spot is in the headwaters of the Clarence River amongst the grandeur of the mountains, many with pockets of snow on them. We saw many alpine plants in flower today, that included the Mountain Gentian, Edelweiss, species of the Celmisia daisy, and yellow buttercup, probably a Ranunculus species. Vegetable sheep were growing well on rocks, spongy to touch. 7 ½ hour day. A cold night, with most of us sleeping with our thermals on. Awoke to a slight frost and another perfect day in the mountains. Left our alpine camp site at 8.15 A.M. Onwards and upwards, over boulders and scree. A steep climb up to the top of the un-named pass (1960m) below Belvedere Peak. Took an hour for some of us, and less for others! Once on top, the views looking down into the upper reaches of the East Sabine Valley were brilliant. A steep descent of 300m took us into the headwaters of the East Sabine River. A morning tea stop, before making our way through tussock, boulders and the native Spaniard, many in flower. Crossed the river a few times, a bit of up and over to avoid the gorgy bits and in the distance was the start of the beech forest, an indication that we were coming down out of the alpine vegetation to the lower land. Found a good spot by the river at the start of the beech forest for lunch. After lunch carried on making our way down the river, which was becoming wider, and came upon a few well used camp sites, and from hereon, we followed a track of sorts. At 4.15 P.M. we set up fly camp in a sheltered clearing by the river. A highlight of our day was seeing a spiker deer running across the mountains into the scrub. 8 hour day. Another brilliant day. Packed up and away at 8.15 A.M. on our journey down the East Sabine Valley. Initially, we picked our own way through the river and the beech forest until picking up a marked track. At 9.45 A.M. came to the swing bridge across the East Sabine River. From the headwaters to the bridge the trip was approx. 10 ks. (Not 3-4 hours as in old guide book!) So, it was over the bridge, and a right turn towards the Travers Saddle, a 3hr. 1000m climb. For the first time, we are now on a marked track. Had morning tea down by the river flats before the climb. The track is very steep once out of the trees, going up a shingle bank for about an hour before entering into a mixture of scrub, rocks and scree. Had lunch in the alpine herbfields and at about 2.00 P.M. came to the top of Travers Saddle. The descent was a reasonable gradient on a well defined track through alpine rock gardens and waterfalls, with many alpine plants in flower. About an hour through this picturesque landscape we came down through beech trees, over a fairly new bridge, and up to the 40 bunk Upper Travers Hut. This hut is new, and built like a lodge. Arrived at around 3.00 P.M. Has some great views. Straight up to the left coming into the hut from the saddle is Mt. Travers, and there is a great view looking down into the Travers Valley. The hut has a woodburner, and a great stack of firewood. There were about 7 other trampers in this hut, the first people we’d encountered. 6 ¾ hour day. Another brilliant day in paradise. Up and way at 8.30 A.M. Down through the Travers Valley following the Travers River. No too far along the track is evidence of a huge avalanche that has smashed trees on the track side of the river, thus resulting in a new section of track higher up. This track is well defined and marked, and 2 hours later came to the John Tait hut, this one has a conservatory! Beautifully situated by the river in the valley. Morning tea stop. A very pretty walk that continued until our turn off to the Hopeless Creek Hut by a bridge, an hour after leaving John Tait Hut. Had lunch by the river up from the bridge. At 1.00 P.M. set off again on a well marked track, that is a pleasant walk through beech forest. The track starts off flat and goes uphill on a gentle gradient, nothing too strenuous for a change! 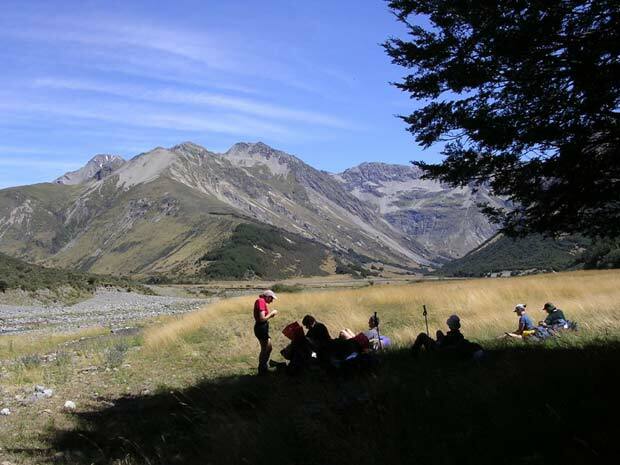 At 2.30 P.M. we arrived at Hopeless Creek Hut situated in a clearing in the beech forest with a huge scree slope across the Hopeless River. This 8 bunk basic hut was built by members of the N.Z. Alpine Club, and was opened by Sir Edmund Hillary on 23rd December 1967. It too, is on D.O.C.’s doomed list, don’t know why, as looking at the Hut Book it is fairly well used. Behind the hut looms Mt. Hopeless. 6 hour day. A day without a saddle! ‘Tis yet another glorious day and at 8.15 A.M. set off bound for Mt. Angelus Hut. The track continues up through the beech forest for about ¼ of an hour and then comes out of the beech into the scree slopes heading towards Sunset Saddle. Once again, it’s steep so zig zag is the way to go up through the loose scree. On a rocky plateau beside a cold and crystal clear tarn we had our morning tea before carrying on up and not too far along on the right, we passed another tarn. It was up, up all the way, over a patch of snow and still up we went. However, it did come to an end as at 12.15 P.M. the summit of Sunset Saddle (1900m) was reached. The views were panoramic. 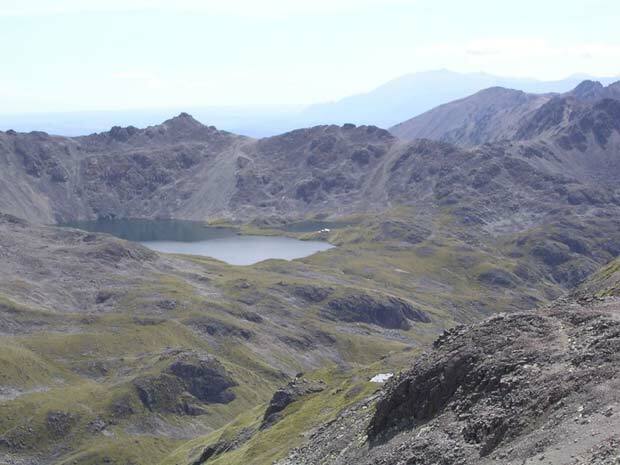 Looking down in front of us were 3 tarns, in the middle of this panorama situated between 2 tarns was Angelus Hut and Mt. Robert Range behind, and way out beyond in the far distance was Kahurangi National Park, and Nelson. To our right was Mt. Angelus with 2 people sitting up on it, no doubt enjoying the views. We decided to have lunch on the saddle and enjoy the views before us. Eventually, we made our way down everybody picking different ways to pick up the track in the distance. Once out of the scree, it was like walking through a garden, only this one is alpine, with many flowering plants, rocky outcrops, and even a tumbling waterfall with plants growing all around it. Just beautiful…however, some members of the party had glazed expressions when shown the detailed beauty of alpine flowers (for the hundredth time!). Arrived at Angelus Hut 2.15 P.M. This 36 bunk hut is also built like a lodge. A hut warden arrived walking in over the Robert Range. By 6.00 P.M. this hut is fairly full. Active N.Z. an outdoor adventure company from Dunedin have bought a party in, plus others have made this hut into a noisy rabble of voices. A change from our alpine camp sites. 6 hour day. Yep, its another beautiful day. Left at 8.15 A.M. bound for Robert Ridge. It’s straight up, but not for long! The route passes through boulders, rocks and loose scree. Great views on both sides. To our left, is the Howard Valley and to the right, Travers Valley. Had morning tea just off the track in a sheltered place out of the wind. Continued on past Mt. Robert Ski Field, with it’s cluster of buildings, and turned left into the carpark track from the ski field. About ¼ of an hour along this track we turned right into Paddys Track heading for Bushline Hut for lunch. Just before the hut is a spectacular view down to Lake Rotoiti, and St. Arnaud township and the hills beyond. Away to the right is Rainbow Station, the beginning of this trip. Had lunch in the sun on a rise overlooking Lake Rotoiti. Some of us had a snooze in the sun, until our leader thought that it was time we should be on the move again! The track down through the tussock is a zig zag as it is quite steep, but also a sign tells us to keep to the track as erosion is a problem on these hills. A recent bush fire was evidenced by burnt out trunks and stumps on the hillsides. This track meets Mt. Robert Carpark Track shooting off to the left and the West Bay Track, which is the track we continue on, now amongst Manuka and scrubby bush. It is a metalled track that comes out onto Mt. Robert Ski Field Car Park Road that heads off to the left, and Lake Rotoiti to the right. We take the road to the lake. This road bash is about an hour past the Lake Rotoiti Scenic Reserve onto the main highway, into St. Arnaud and the Yellow House to arrive at 3.00 P.M., two hours after leaving Bushline Hut. As it was reasonably early in the afternoon, we all took the opportunity to do some washing, especially the smelly socks! And of course, a lovely hot shower. Bliss!! Then ice creams, pies, and beer! That evening we all went down the road to Elaine’s Alpine Café for tea. 6 ¾ hour tramping day. This was the end of our 7 day tramp. A tramp that was often challenging, particularly for the ‘blouses’. The first three days we were in untracked country, and we traversed four 1800-1900m saddles in 5 days. Another brilliant South Island tramp.